The Ichthys Field is estimated to contain more than 12 trillion cubic feet of gas and 500 million barrels of condensate. Approximately 70 per cent of the LNG produced by Ichthys LNG is scheduled to be supplied to Japanese customers. Ichthys LNG will help to meet growing energy demand in the region, while contributing to the Australian way of life. The Ichthys LNG Project is a project led by INPEX (Operator, participating interest: 62.245%) alongside major partner TOTAL (participating interest: 30%) and the Australian subsidiariesof CPC Corporation, Taiwan (participating interest: 2.625%), Tokyo Gas (participating interest: 1.575%), Osaka Gas (participating interest: 1.2%), Kansai Electric Power (participating interest: 1.2%), JERA (participating interest: 0.735%) and Toho Gas participating interest: 0.42%) that involves liquefying natural gas lifted from the Ichthys Gas-condensate Field offshore Western Australia at an onshore gas liquefaction plant constructed in Darwin, Northern Territory, and producing and shipping approximately 8.9 million tons of liquefied natural gas (LNG) and approximately 1.65 million tons of liquefied petroleum gas (LPG) per year, along with approximately 100,000 barrels of condensate per day at peak. While the capital expenditure required for production start-up during the period between the final investment decision (FID) and production start-up was projected to be around $40 billion on a 100% project basis, this figure has risen several percent due to factors including the delay in production start-up. The Ichthys LNG Project is a large-scale LNG project by global standards, and is expected to be operational over a period of 40 years. In 1998, INPEX acquired an exploration permit in the block where the project is located, and following development studies including exploration, evaluation and FEED work, the company announced its final investment decision (FID) in January 2012. Thereafter, following the construction of the required facilities, the Project commenced production of gas from the wellhead in July 2018 and commenced shipment of condensate and LNG in October 2018, and LPG in November 2018. Four years later, the Australian Prime Minister officially launched construction at the 361 hectare Bladin Point site at a ground breaking ceremony on 18 May 2012. When completed, the Project’s LNG plant at Bladin Point near Darwin will cool gas from the Ichthys Field and transform it into liquid for transport. The gas will come to Darwin via the Project’s 890 kilometre gas export pipeline. When completed, the Project’s onshore facilities will include: two LNG processing trains, LPG and condensate plants, product storage tanks, a combined cycle power plant, administration facilities, utilities and a product load out jetty. The LNG processing trains will have the capacity to produce 8.9 million tonnes of LNG per annum. Lead onshore contractor, JKC Australia LNG (JKC), is responsible for construction of the Project’s onshore facilities. INPEX officially opens Ichthys LNG onshore facilities on the 16th of November 2018. At the centre of the Project’s offshore development in the Browse Basin is the Ichthys LNG Project’s large, floating central processing facility (CPF). All future production will be processed through this floating giant. Natural gas and condensate from the Ichthys Field's subsea wells will undergo initial processing on the CPF to extract condensate and water and remove impurities in order to make the gas suitable for transmission to Darwin via the 890 kilometre gas export pipeline [GEP]. Most of the condensate will be transferred to the nearby floating production, storage and offloading facility (FPSO) for offshore processing, with the remainder sent to Darwin with the gas via the GEP. The Ichthys Project’s CPF - Ichthys Explorer - is the world’s largest semi-submersible platform. 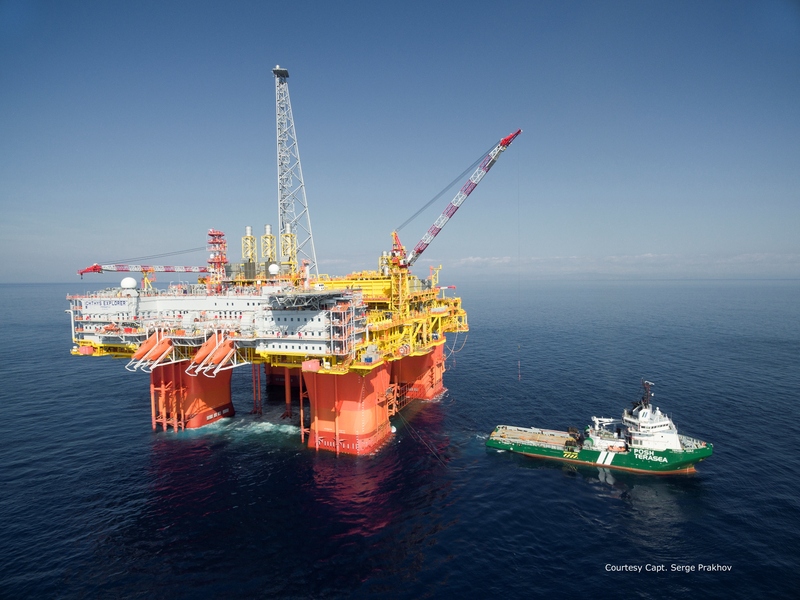 It was constructed in South Korea at the Samsung Heavy Industries shipyard before being towed about 6,000 kilometres to the Ichthys Field in the Browse Basin, offshore Western Australia. It is now permanently moored near the Field for the life of the Project by 28 mooring lines, representing more than 25,000 tonnes of anchor chain. The Ichthys LNG Project’s floating production, storage and offloading facility (FPSO) will be used for condensate dewatering, stabilisation, storage and export. 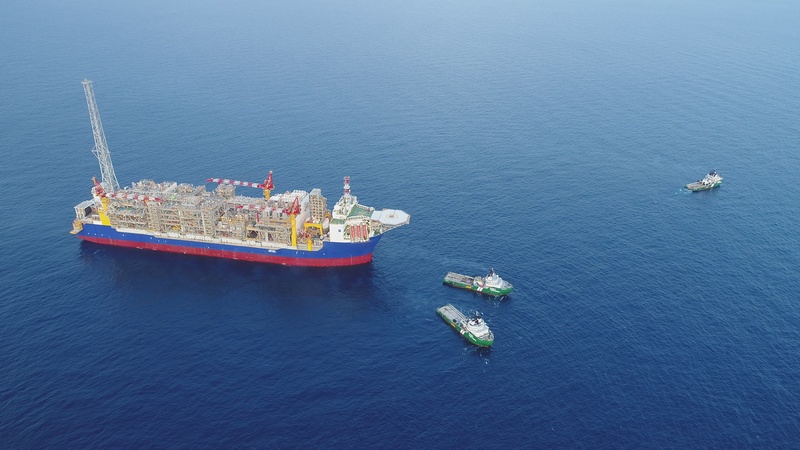 The FPSO, named 'Ichthys Venturer', will process and store most of the condensate delivered from the Project’s CPF before periodically offloading it to carriers for export to market. Remaining product will be compressed, returned to the CPF via a subsea transfer line and sent to Bladin Point near Darwin via the 890 kilometre gas export pipeline. 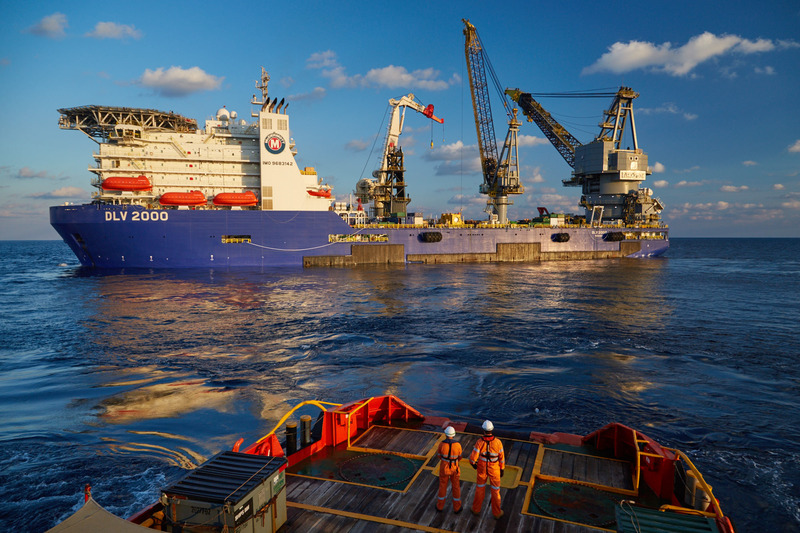 Once commissioning is completed, the FPSO will be towed about 6000 kilometres to the Ichthys Field in the Browse Basin, offshore Western Australia. It will be permanently moored on a non-disconnectable turret for the life of the Project about 3.5 kilometres from the Project’s CPF and has the capacity to accommodate a workforce of up to 200.